Wat Arun rises from the Chao Phraya River as a timeless symbol of Thai unity. 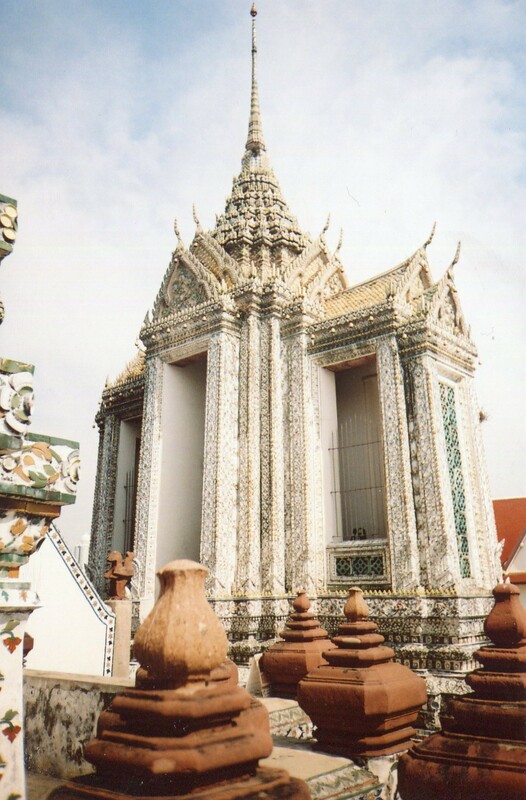 But explore Wat Arun closely and you’ll find many more things to savor. 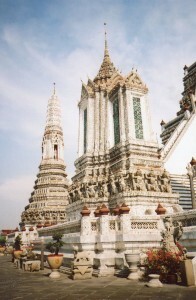 Wat Arun shines with symbolic meanings, and they’re expressed in ways that are uniquely Thai. The last post explored Wat Arun’s outer form. Now we’ll take a deeper look at its enchantments. Wat Arun is in the form of Mt. Meru, the symbolic center of the Buddhist and Hindu universe. So is Angkor Wat, but Thais made this form their own. 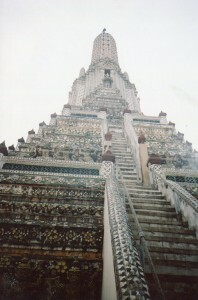 Both Wat Arun and Angkor Wat have a central tower surrounded by 4 other towers in the corners. 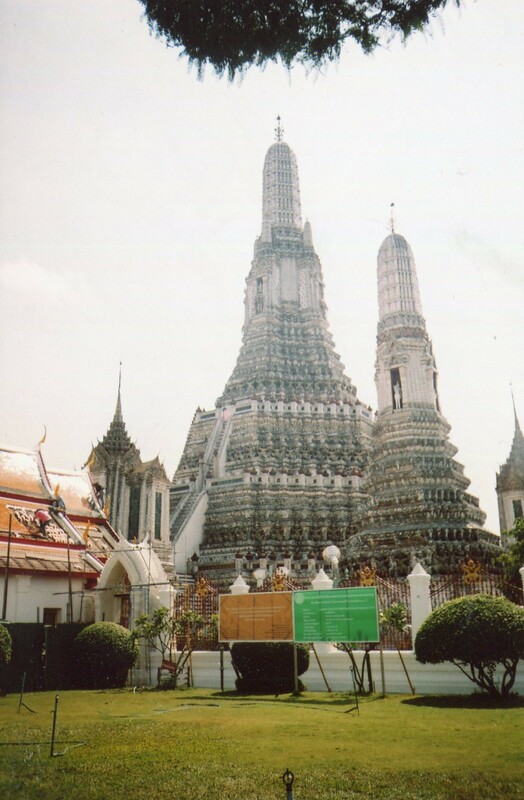 But Wat Arun’s towers are more elongated. 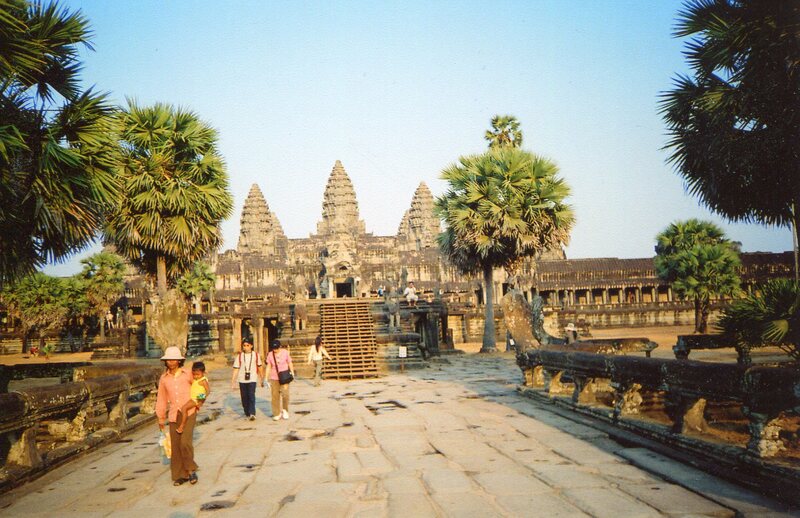 And Thais subtracted Angkor Wat’s massive frontage. Wat Arun’s forms are pure grace. 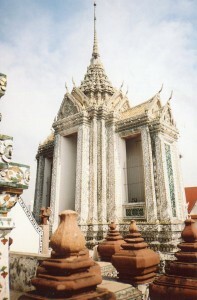 Above is a mondop (an open shrine hall) at Wat Arun. There are 4, and each stands between 2 of the corner towers. So the first photo in this post shows you a mondop on the right and a corner tower on the left. Each mondop contains images that represent 4 key events in the Buddha’s life: birth, enlightenment, his first sermon and his passing away. So Wat Arun’s cosmological symbolism (Mt. Meru, and the Buddha’s life correlated with the cardinal directions) is couched in forms as graceful as the Buddha’s compassion. Thais love fun, and they often put humor into their art. 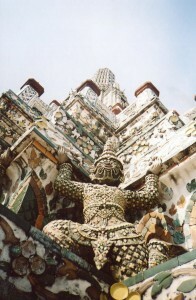 Thus mythological figures support Wat Arun’s main spire. 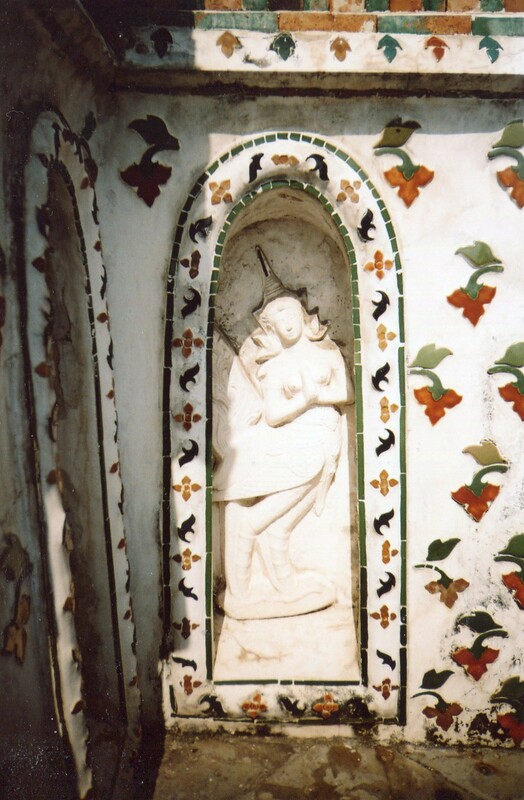 Wat Arun is covered with pieces of multicolored porcelain. Its bright reds, blues, greens and yellows dramatically contrast with the pure white. But under the tropical sun, all seem to radiate nature’s power. These glimmering colors felt like a force-field as I walked around the upper gallery. Scientific language says that white reflects all colors. But the word reflect is much too weak to describe Wat Arun. Its colors radiate energy. But Thai’s like graceful and sinuous forms too. 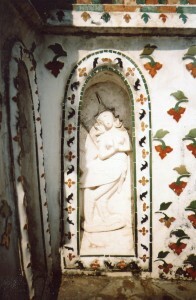 The dancing figure above is one of many within niches around Wat Arun. Its flowing forms soften the glimmering porcelains and bright whites so that nature’s power seems benevolent. Wat Arun soars majestically, but with balance, fun, and non-confrontational forms, which Thais have stressed since they created their own states in the 13th century, and probably before when they lived in small communities in riverine valleys in southern China. Wat Arun takes these ancient values to perfection and it deserves to stand with any Gothic cathedral. Sabai!